Sensi #32 fem (Silver Haze x Fire OG) – outstanding sativas of the old and new schools blended to powerful perfection. 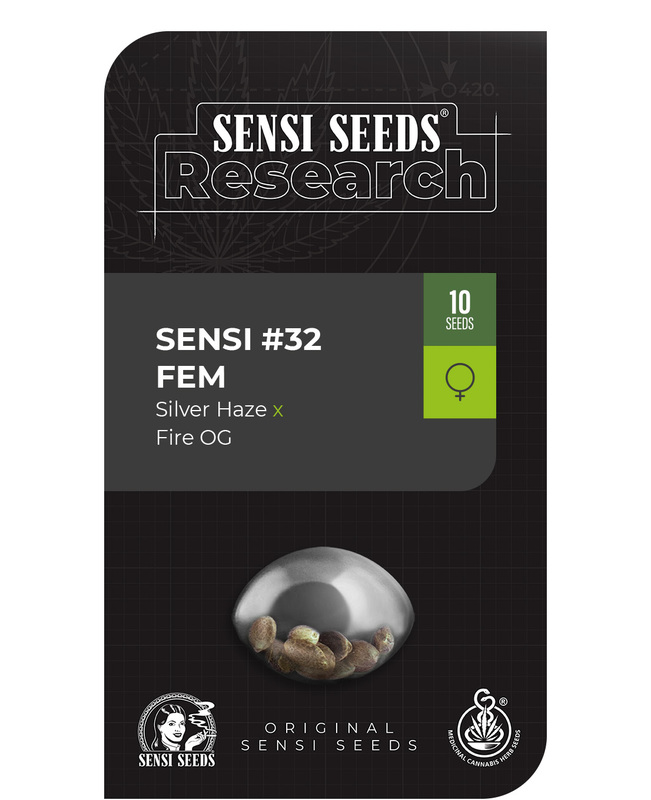 SENSI #32 FEM combines one of the most exciting OG cannabis varieties to come out of the US in recent, Fire OG, and one of our favourite cup-winning sativas, Silver Haze. In this cross, we chose to amplify the sativa qualities even more while preserving the strength and flavours from the Fire OG. The result is a powerful hybrid producing a copious amount of resinous buds. SENSI #32 FEM has been known to stretch 200% during its flowering period; indoors, it can easily reach 150 cm. Outdoors in a sunny, Mediterranean climate, it can easily reach 200 cm. This height gain coupled with the long flowering period results in excitingly heavy yields. The taste and aroma are a mouth-watering blend of citrus, spice and the earthy undertones from the Fire OG’s Kush lineage. This one is one is already a Sensi Seeds Research team favourite! Sensi #32 Feminized is a is a feminized strain, which will only produce plants that flower as females.. The Sensi #32 Feminized strain has large proportion of Sativa genes in its background. Sensi #32 Feminized will have a relatively long flowering time. Sensi #32 Feminized will have average height gain during flowering. Sensi #32 Feminized can produce a very large yield, but may require a little extra care to achieve their full potential. Sensi #32 Feminized can be grown outside in a warm, sunny climate with a long summer. Sensi #32 Feminized Seeds is added to your shoppingcart! Sensi #32 Feminized Seeds is added to your wishlist!